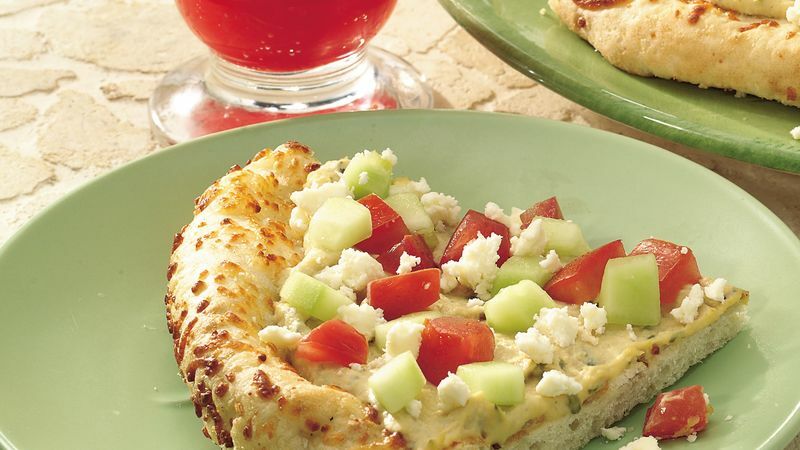 On each pizza crust, layer half each of the hummus, cucumber, tomatoes and cheese. Cut each pizza into quarters. As cucumbers age, they can pick up a bitterness in the skin, hence our recommendation is to peel them. If you are lucky enough to have a cucumber fresh from the garden or farmers' market, save a step by not peeling the cucumber. Create Cool Greek Pizza using one large crust. Increase the amount of hummus to one cup and use additional vegetables and feta cheese as desired.